Augmented Reality (AR) is a technology that superimposes a computer-generated image on a user's view of the real world, thus providing a composite view. The composite view of AR brings that necessary connection between maps and the real world. It is the missing link to a seamless user experience. Users can make better decisions faster because they can immediately interpret their data in context with the world it is intended to represent. The aim of creating geospatial data is to document the world around us as accurately as possible, so as to communicate clearly and in some cases, predict possible outcomes. To do this GIS managers create data to represent their company’s assets. We recently caught up with Chris Anderson, VP of Augmented Reality, and he shared some of his thoughts on how AR is changing how we create GIS data. I recently reviewed GIS data for one of our customers who has some experience working with our Argis Lens in the field, but was having difficulty with their geospatial data. What I found was that though the data was great for a 2D map; however, it was inaccurate when it was used in the world of 3D, namely, Augmented Reality. How did this data become so inaccurate? In most cases GIS data on well sites are hand drawn, possibly through redlining. The practice of redlining is drawing on the screen and later converting the drawing to a feature class in Esri’s ArcGIS Desktop that stores attributes, geographic location. The purpose of the redline is to act as a markup feature for communicating geographic information to the GIS editors. This method would cause inaccuracy of placement of the data for field operations especially if they were not quality checked after they were drawn and before they were introduced as production data. 5 meters (~16ft) is a long distance when viewing it in person. It can mean the difference of an asset being on one side or the other side of a road. Keep in mind that redlining is normally done using an aerial photo and back in the day those photos may have been 10ft resolution while now you can normally get 2.5ft for the right price. The point being that you have already included a certain amount of error because you weren’t using survey grade GPS points. I also noticed that the 3rd party pipelines appear to have been digitized for better viewing on 2D maps by placing them 15-20 feet apart. When I was a mapper it was common practice to digitize one line and then duplicate and offset the other lines. Needless to say this removes the possibility of line crossings that may or may not occur. This was a great solution for working with a 2D map where accuracy of 10+ feet is fine and shows well on an aerial photo or a scale of 1:2400 or more, but it can become an issue when viewing in the real world through Augmented Reality. Even with the ability to adjust your position in Argis Lens it still may prove insufficient to displaying its true location. An example to better describe this is if a line is digitized along a road but digitized on the incorrect side or crossing the road when it should only be on one side of it. At certain scales such as 1:2400 this would not be an issue because the line would still indicate where in the world it is; however, if you are standing on that road, and attempting to physically locate it, 10ft+ can make a huge difference (assuming 2 lane road with a standard 12ft lane). With AR, a new level of detail and accuracy is needed with digitized assets. If you are in a similar situation, we recommend cleaning up the locational inaccuracies of the data with the knowledge of field technicians, GPS units, and collection software used in conjunction with the GPS like Tri-Global’s Utilipad which can integrate with locators and ease the collection burden. Argis Solutions is the most knowledgeable about improving current 2D quality GIS data and translating it into functional 3D, augmented reality, ready data. AR is coming to the locate field. It will improve accuracy because those knowledgeable field technicians can step directly into the map and document changes, and location of underground assets. Preparing your data for this technology is not only money well spent but it is the way of the future. Don’t let yourself fall behind. Chris Anderson is the VP of AR at Argis Solutions, with over 20 years in the field of GIS, a GISP, and a member of the Esri community based out of St. Louis, MO. Robert Poynter, Graduate GIS Consultant at Interpret, recently tried out the Argis® Lens. Check out his take on it and how AR will become the industry standard. Augmented reality is the next big step for location intelligence. Just as basemaps helped define and communicate spatial data on a 2D plane, augmented reality does the same with the world around you. We’re no longer limited to looking down - we can look forward, under, above and through. This is a fast-moving and competitive industry on the edge of a major boom, and we’re excited to be a part of it! I’ve been trialing a new app called Argis® Lens from a small Colorado start-up, Argis Solutions LLC, to explore and visualise Christchurch’s storm water system. While polygons and lines don’t always look too exciting on a screen, the experience of being inside the layer is more entertaining. Using a feature service on a dev server, I’m able to add layers to my scenes on an iPad and then walk around in them. The interface is simple and intuitive, offering the user a variety of options and inputs – camera height, visibility distance, a grid for referencing, and the ability to navigate across the entire map from an office chair if the weather’s rough. Check out complete post here. A variety of fallouts can precipitate from a damaged infrastructure during excavation: sinkholes from water drainage; suspension of utilities from internet, phone, electric, and gas companies; environmental fallout from sewage or oil; or an explosion caused when a spark hits a damaged gas line. These kinds of accidents cost facility owners hundreds of thousands if not millions in clean-up and damages. Considering the costs and dangers associated with these kinds of mistakes, it is no surprise that safety is the number one priority of many construction and excavation operations. Getting accurate locates is critical to the safety and mission of excavation teams, yet busy and demanding work schedules, deadlines, and poorly mapped areas create direct conflicts with the priorities of safety and precision. Many locate technicians struggle with the balance between accuracy and speed while they rush to complete all of the days open tickets. And, poorly mapped regions slow work and add an element of uncertainty to the technicians and onsite inspectors in the field. Read more, pg. 38 Special Issue: Underground Utility Locating. For many One Call Support outfits, the current method of locating underground assets prior to excavation largely depends on a utility locate technician detecting an electromagnetic field induced on the utility for location purposes, and then placing marks along the detected line. Ideally, detected lines are double checked against existing records to ensure accuracy, but often existing records may be inaccurate or nonexistent. Poorly mapped areas that conflict with the locates flagged by technicians slow down productivity and often provides challenges in safely excavating around critical infrastructure. Updating existing geospatial data with accurate locations can greatly speed up future projects, saving locators hours in the field and giving excavation crews unparalleled levels of confidence in where they dig. Once a line is physically located either by traditional locate techniques or ideally when it is first installed, next generation GNSS receivers, such as the Asteri X3 paired with Tri-Global’s UtiliPad, are capable of marking locates with cm level accuracy. Companies that invest in this kind of highly accurate GIS data collection can reap benefits in efficiency and certainty in the future. When that location data is uploaded into GIS data and paired with augmented reality (AR), locators can literally see the desired line beneath the dirt by viewing the field through an iPad or Android device to double check their work. Additionally, this technology allows onsite inspectors to oversee excavation with remarkable ease and precision. 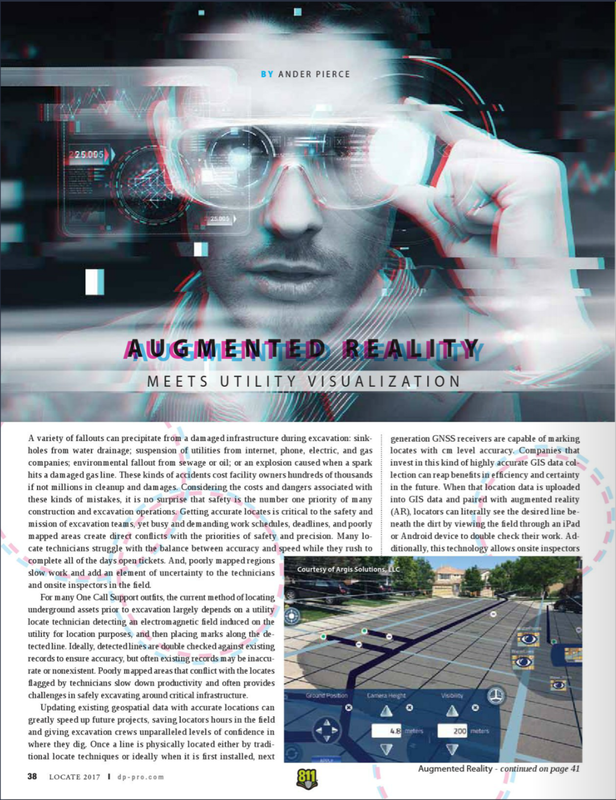 AR technology is already available to help utility companies and municipalities to create time saving and safer records of their infrastructure. New or existing geospatial data can be transferred into mapping software and used in conjunction with an AR mobile device technology such as the Argis® Framework provided by Argis Solutions. This improved workflow is robust, field ready, and offers superior communication between location technicians and central support. One Call Support Departments and Companies that have implemented AR within their field operations have found the technology provides a higher confidence level in locate operations thus increasing overall safety and accuracy in their excavation while investing in the future productivity of infrastructure maintenance. Damage Prevention Professional Magazine is a quarterly industry publication with a print circulation of 30,000+ and digital circulation of 70,000+ throughout the United States and Canada, along with a contingent of international subscribers. This publication addresses cross-industry concerns to damage prevention stakeholders. This article was originally published in the Special Issue: Underground Utility Locating. Paul Hoemke, Business Analyst at Argis Solutions, did fascinating podcast with Karen Jagoda at the Esri UC earlier this month. Listen to the whole podcast at Digital Politics with Karen Jagoda. We've reproduced a few of the highlights here. AR is ready for geospatial application. We received a very positive reception at the Esri User Conference in San Diego, CA. Read more about the end of this Argis Road Trip.